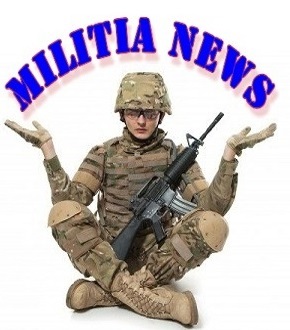 Militia News – Militia News is dedicated to informing, promoting, and training the militia. The Militia is dedicated to the preservation of our FREEDOM, the security of our RIGHTS and the Restoration Of Our Constitution to it's rightful place as the law of our Great Republic! In the beginning of change, the Patriot is Scarce, Brave, Hated and Scorned. When his cause succeeds, the timid join him. For it cost nothing then, to be a Patriot. The treasonous adversaries that are common to Americans everywhere. If you don’t hate the Marxist Progressive Traitors, then you are a Damn Fool, or One of them. Militia News is dedicated to informing, promoting, and training the militia. Our loyalty is to the foundation on which America was built – a foundation which, in recent years, has been seriously attacked and undermined. Some examples of this can be seen by the government taking an ever larger portion of your wages, taxing your property, monitoring your speech, tracking your location, restricting your travel, controlling your healthcare, and can now assassinate you without charge or trial anytime it wants by simply calling you a terrorist. To that end, you should ask yourself who is going to stand up and defend your liberty from an ever growing tyrannical government? Not the politicians, for many of them are working together with the perpetrators. Only the Militia is empower by the Constitution of the United States to protect the people from the government. This is clearly stated in the Second Amendment: "A well regulated Militia, being necessary to the security of a free State, the right of the people to keep and bear Arms, shall not be infringed." The Constitution of the United States recognizes that our unalienable rights are given to us by God, not by our government. We, the People of the United States, must not stand by while these precious rights are taken from us. ANY INFRINGEMENT ON THESE RIGHTS must be defended by the people of this nation. We must not allow treasonous zealots and tyrants to blatantly ignore the Constitution and infringe on our rights. The United States Constitution is vital for our liberty and we must stand and defend it against all enemies, foreign and domestic. “Who are the militia? Are they not ourselves? Is it feared, then, that we shall turn our arms each man against his own bosom? Congress shall have no power to disarm the militia. Their swords, and every other terrible implement of the soldier, are the birthright of an American … The unlimited power of the sword is not in the hands of either the federal or state governments, but where I trust in God it will ever remain, in the hands of the People.” — Tench Coxe, 1788. Militia News is not constrained by the government-controlled media, or tied to the culture of insular thinking that is dominated by special interests. We provide relevant, accurate and honest news about God, Family and Country.